A portion of the southeastern flank of Olympus Mons as imaged by the High Resolution Stereo Camera on ESA’s Mars Express on January 21, 2013. (Left) This 1894 map of Mars was prepared by Eugene Antoniadi and redrawn by Lowell Hess. 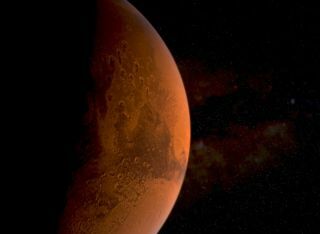 (Right) A Hubble Space Telescope photo of Mars shows the modern view of our neighboring planet. The dangerous dust storm at the start of "The Martian" might have had a very different effect in reality. This Hubble image of Mars, taken in 2005, shows a 930-mile long dust storm raging across the planet's equator.